Spatial indexes, such as those based on Quadtree, are important in spatial databases for efficient execution of queries involving spatial constraints. In this paper, we present improvements of the xBR-tree (a member of the Quadtree family) with modified internal node structure and tree building process, called xBR\(^+\)-tree. 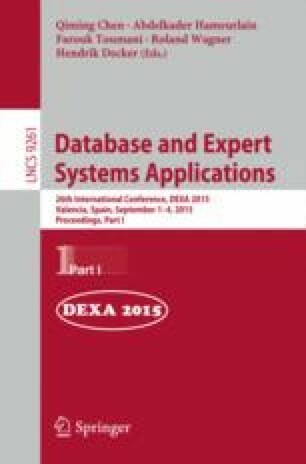 We highlight the differences of the algorithms for processing single dataset queries between the xBR and xBR\(^+\)-trees and we demonstrate performance results (I/O efficiency and execution time) of extensive experimentation (based on real and synthetic datasets) on tree building process and processing of single dataset queries, using the two structures. These results show that the two trees are comparable, regarding their building performance, however, the xBR\(^+\)-tree is an overall winner, regarding spatial query processing. Spatial access methods Quadtrees xBR-trees Query processing. G. Roumelis, M. Vassilakopoulos, T. Loukopoulos, A. Corral and Y. Manolopoulos—Work funded by the GENCENG project (SYNERGASIA 2011 action, supported by the European Regional Development Fund and Greek National Funds); project number 11SYN_ 8_1213.